Growth Coach. ​Author. Keynote Speaker. Workshops. Companies such as Facebook, Dropbox and Airbnb have achieved unprecedented rates of growth through rapid data-driven experimentation in product, marketing and user experience. In the next few years, the majority of digital companies will adopt this approach or will face stiff competition from a competitor who uses it. I call this approach "growth hacking." I’m passionate about helping companies with “must have” products achieve breakout success using growth hacking. I coined the term growth hacking in 2010 after using it to ignite sustainable growth for several companies including Dropbox, Eventbrite, LogMeIn, and Lookout - each now category leaders worth billions of dollars. I offer workshops and coaching to help startups and established companies achieve breakout growth success. For Established Companies - Established companies achieve breakout growth when they adopt a cross-functional, data-driven approach to rapid experimentation. But siloed teams and entrenched habits makes this growth transformation challenging. I have developed coaching and workshop programs that have helped ignite growth transformation at established businesses ranging from a few hundred employees to a key profit center for one of the world’s most valuable companies. Contact me for more details about how I can help with your growth transformation. For Startups - Startups have a significant advantage using a data-driven, cross-functional approach to rapid growth experimentation. Especially when they are able to build the right systems, team structure and execution habits soon after reaching product/market fit. I’ve helped implement this approach from the ground up at several startups that are now multibillion dollar companies and I offer startups this expertise through my writing, keynotes, group workshops and coaching. Contact me for more details about how I can help your startup accelerate growth. 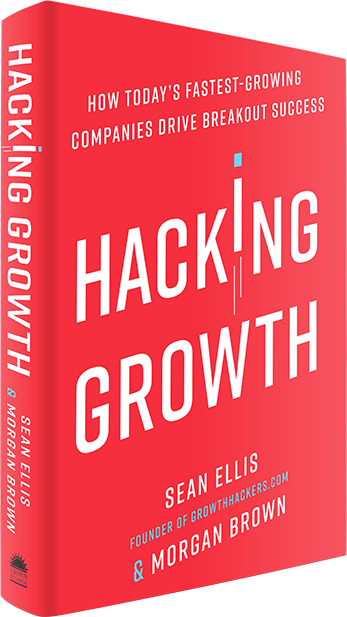 Sean Ellis is co-author of "Hacking Growth", the definitive handbook on growth hacking that has been translated into 16 languages. Sean coined the term "growth hacking" and applied in the early days at Dropbox, Eventbrite, LogMeIn, and Lookout (all worth billions today).